Currently residing in Barcelona, Spain, Laura Karney is an oboist who enjoys a successful free-lance career that has so far spanned 13 countries across 3 continents. Hugely varied in her interests, Ms. Karney can be heard performing on both oboe and English horn, in concerts ranging from historically informed performances of Baroque and Classical repertoire on period instruments to working with contemporary composers and ensembles and giving world premiers. Ms. Karney has worked with the SEM ensemble, Alarm Will Sound, Kammeroper Orchestra im Konstanz, Peconic Chamber Orchestra, Britten Sinfonia, the Lisbon Metropolitan Orchestra, the Südwestdeutsche Philharmonie Konstanz and the Orquesta de Valencia in Spain. She is also a founding member of Zoco, a guitar and oboe duo, the Prestige Quartet a wind ensemble, the Skogensemble a small chamber ensemble currently working on a chamber opera by a young American composer, and the multimedia chamber music ensemble Ardesco(www.ardesco.org), comprising of string quartet, bass, oboe and lighting designer. 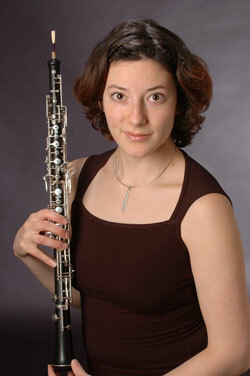 The foundations of her performing career came from her undergraduate and post graduate studies in oboe at the Eastman School of Music in Rochester, New York, and the Hochschule for Musik in Trossingen, Germany under the tutelage of the internationally renowned oboists Richard Killmer and Nicholas Daniel, and her work with Martin Stadler and Carlo Barone on historical performance practice and instruments.